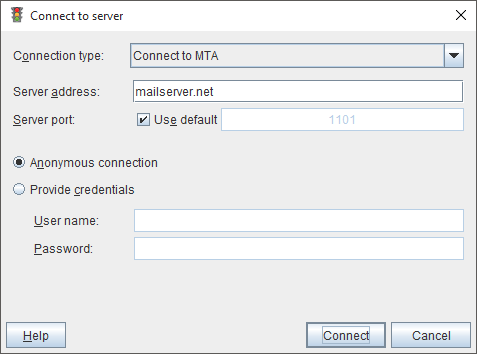 Connect to MTA - the application will connect to the mail server. The server module must be installed and correctly running. Simulate connection to MTA (for testing) - the application will not connect to the mail server. It will just simulate the connection. This mode could be used to familiar with the application before installing the server module on the mail server. Hostname or IP address of the mail server where server module was installed. When Simulate connection to MTA option is selected then any server address (name) could be used. TCP port on which the server module is listening. By default port 1101 is used. Application uses own credentials system, so during first connection Anonymous connection must be selected. See more about Access Control.